Patter has given us a lovely hymn to work with and is one that I have sung in Church. 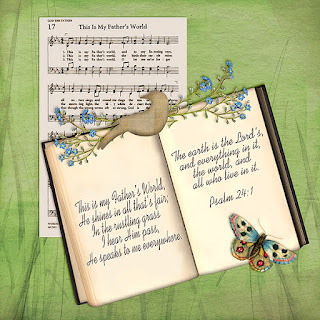 Please visit Patter's blog HERE so you can read the writer of this hymn and also the encouraging teaching Patter shares in her devotional thoughts. The segment of the hymn that I have shared on my digital page stood out to me. It is so true that our Father does speak to us everywhere - especially in nature ( and of course in His written word). I love to sit at the beach and listen to the waves crash on the rocks or just the noise of them rolling into the beach. There is something soothing about it and I believe it is God speaking to me ... telling me this is His world and that includes me.... I am His. He created me and then bought me back to Himself with the sacrifice of His precious Son - Jesus, my Lord and Saviour. A beautiful page and scripture ! This is just beautiful and I love this kit! Oh, Anne-Marie!! It's so beautiful! It's a joy to hear you speak of the ocean too. It's been a long time since I've seen the ocean!